River Betties are fish that can be caught in ponds, lakes, and other bodies of water. 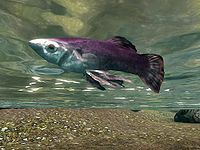 Despite their name, they are no more likely to be found in rivers than other fish in the game. Damage Health poisons made with river betty are 150% stronger than (2.5x as strong as) those made with other alchemy ingredients with this effect; they are the strongest poison ingredient that can be obtained in unlimited quantities. See the effect page for details. They are also one of only three ingredients with a Fortify Alteration effect in vanilla. The Dragonborn add-on also adds Burnt Spriggan Wood. Fish barrels have a 25% chance of containing river betties. This page was last modified on 28 October 2018, at 06:13.